Jenny Milchman – Okay, this one is cheating because we did actually have a whole day and dinner together, but that only adds to why I want to have another lunch with her. Jenny is a huge advocate for bloggers and connecting them with authors and she’s filled with amazing ideas, so she always leaves me inspired. (You can read my reviews of her books here and here). Brad Meltzer – This one’s an easy because Brad Meltzer, in addition to being a stellar author, also has his own show that cracks codes and looks at conspiracies (it’s appropriately named Decoded) and I can only imagine the kinds of conversations we could have. The possibilities are endless. (You can read about when I met him here). Neil Gaiman – I’m only recently on the Gaiman-train but he just seems so cool and I want to experience that firsthand. 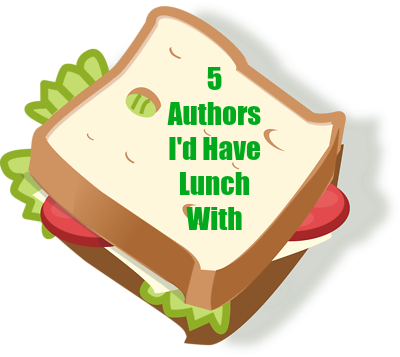 It’s his coolness that put him on my list of authors I might have a chance of lunching with, even though I know it’s pretty far-fetched. Regardless, I imagine myself walking away with a swagger and a whole new take on life. (You can read my reviews of his books here and here). Dr. Lois Frankel – Her book, Nice Girls Still Don’t Get the Corner Office, completely changed how I approach my work life. I listened to it on audiobook so I feel a connected to her in a way. She’s smart, realistic, funny, and an absolute inspiration and I want more of that in my life, especially across the lunch table. (You can read my review of her book here). Simon Winchester – This one’s easy – he’s smart, knows almost everything, and I’d walk away smarter. I’ve only read one of his books (so far) but I plan to read more. Plus, I hear he has a British accent and who doesn’t want to listen to that? (You can read my review of his book here).